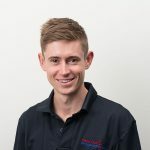 Hugh graduated from the University of Sydney in 2014 with a Masters of Physiotherapy following completing a Bachelor of Health Sciences. Hugh is a keen runner and has represented Australia at a junior and senior level for athletics and cross country. As a result of this, Hugh’s main interests are in sports physiotherapy and in particular, running related injuries. Hugh also has an interest in pre/post-operative physiotherapy, back and neck pain.